This GCSE Statistics resource provides engaging and innovative material to aid learners taking either the foundation or higher syllabus options. 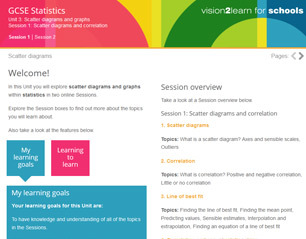 The resource is designed to enable learners to develop their knowledge of statistical concepts and methods, while consolidating mathematical skills and building confidence when handling a range of information. Learners will gain the knowledge needed for their GCSE assessments while developing their ability to represent, analyse and use statistical data in a way which encourages strong perception and independence of thought. Learners will acquire desirable, transferable skills in applying specialised knowledge to real life situations and gain a qualification which complements a wide range of future study and career avenues. The core content is accompanied by innovative features such as the ‘Test yourself!’ activity check points and useful ‘Language of Maths’ glossary which enable the learner to quickly secure their knowledge of recently revised topics. Alongside this is a fun ‘Examinator’ feature which provides exam tips and tricks for those learners who need a little extra support as they work through the course. The course consists of five units, which map to the Edexcel approved GCSE. This unit guides the learner through various types of data and encourages them to choose an appropriate method of obtaining data for a specific line of enquiry. The learner will acquire a solid understanding of population and sampling while learning how to collect data through observation, surveys, experiments, questionnaires and measurement. This unit is about representing and processing qualitative, discrete and continuous data through the use of tables, charts, diagrams, databases and pictorial representations. The learner will then approach the data analytically while understanding mode, mean and median averages as they apply to discrete and grouped data. This unit teaches the learner to plot data points on a scatter diagram while understanding the distinction between correlation, causality and a non-linear relationship. They will then learn to make predictions using both scatter diagrams and time series while discussing the significance of seasonal variation by inspecting time series graphs. This unit introduces and explains probability, including finding probability of events and using it to assess risk. Mutually exclusive and exhaustive events are covered, along with probability distributions and quality assurance topics for higher tier learners. This unit is designed to aid learners in planning, as well as collecting, representing and evaluating the data required to complete their statistical project. Learners will be guided through formulating and stating their hypothesis alongside developing a strategy of how they intend to collect, process and represent their data.